Heavy Duty High-Rider western cartridge belt with shell loops. Shell loops are sized for .44/.45 caliber ammunition. This style of belt also offered in .38/.357 and .22 cal options. This price is for the gunbelt only. Shown with our plain brown leather holster, sold separately. Click here to see matching holsters and other caliber options for this style of belt. Offered in hip sizes 34 – 52 inches. Belt is stitched from two 1/8 inch thick leather sections, forming a full 1/4 inch finished belt that will stand up to the rigors of daily use. Heavy gauge silver tone belt buckle. Belt measures 3 inches wide. Produced in Mexico by skilled craftsmen, this south-of-the-border original evokes the spirit of the 1800's Southwest. Fill up the loops of your gun belt with our deactivated .45 caliber replica bullets. Our cartridge belts are sized by "hip" size, not waist size. 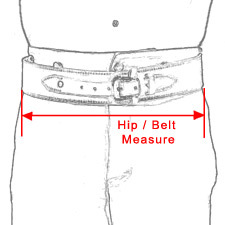 Measure your hips about half-way between your waist and the widest part of your hip, as shown in the diagram. Our belts are sized in inches, and the given size is the last belt hole. Each belt will have up to three inches of adjustability below the labeled sizes. It is VERY important that you measure yourself for a good fit. I RECEIVED MY CARTAGE BELT ! ITS VERY WELL MADE , BUT ! IT DOES NOT MATCH MY HOLSTER. OBVIOUSLY I DONT KNOW THE COLOR OF MY HOLSTER ! " MY FALT " I DO WISH IT WAS THE SAME COLOR AS MY HOLSTER BECAUSE IT IS A VERY WELL MADE CARTAGE BELT , AND LOOKS GREAT. FITS GREAT TO ! Top Quality Leather Cartridge Belt. I followed the sizing instructions and received a flawless cartridge belt that fit perfectly. It was exactly what I was looking for. Well worth the price. I would recommend anyone looking for this type of product, to check with Historical Emporium First. The belt looks nice but is not of high quality leather and has a bonded backing so it feels cheaply made, the two loops that hold the tongue down are super thin and cheap and probably won't last long. I'll keep the belt but would not buy another one of these. Excellent quality, the only reason I gave it 4 stars was the leather color, the first belt I received was a perfect match to my holsters. The second one was so dark that it actually looks black instead of dark brown. But overall I am satisfied with the purchase, would purchase again. Very Satisfied with the quality of this product. I was pleasantly surprised that not only did the belt show up so quickly but how great the quality is. This is a very stout, well made belt. It looks great! Unfortunately I ordered a size too small so I returned the belt for the next size up. Looking forward to getting the new one. This is a quality holster that rides just where I like it. Since my weight fluctuates often it rides a little differently from time to time. I definitely would order this type of holster belt again. The high-Rider cartridge belt is made from high quality leather and good stitching. It works very well with my right hand draw western holster. Fits great, I use it for my cross draw holster and its durable and looks great! I wanted to wait until I had used the belt before I said anything, to make sure the loops didn't loosen, or the buckle broke, or the tongue tear out. None of the above!!! The belt matches the holster perfect and is sturdy enough to take anything I have thrown at it, from scaling the rockies after trophy trout to wrestling hogs in the pouring rain in texas. Awesome product!! Ordered this in dark brown and wanted to wear it the next day , but a note in the box said to lay it out to allow the stain to dry. After calling them they said it only applies to 2 other stain colors. So I was able to wear it after all right away. Very good quality, very happy with it and will order another one soon. Customer service was very polite and answered my question right away. The inner part of the belt that passes through the other side inner belt loop is too short and makes it difficult to put the belt on but it all works. The quality of any and all my purchases has been great. Worth every penny! Fantastic stuff! W hat a blast to wear the products available. High quality for the price! 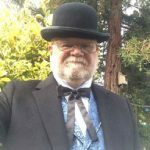 I emailed customer service for help in returning a safari jacket that I had purchased online. Not only did they help me, but worked with me at every stage to answer every question, and even measure a replacement coat. Truly one of the few great experiences that I have ever had with any customer service department. A first class operation beyond measure.